High school religious education teacher Igor Pletikosa vividly remembers his brief contact with Pope Francis as one of the highlights of attending World Youth Day. Source: ACBC Media Blog. Having just returned from his three-week pilgrimage to Panama, Mr Pletikosa is getting back into the swing of teaching as assistant religious education coordinator at Mt Carmel Catholic College Varroville, in the Diocese of Wollongong. He said the experience was not only a journey of faith, but a journey of coming to better know himself, his relationship with God and others. “Although at times it was physically demanding, I felt that even through the challenging moments, God was present and without a doubt the Spirit was speaking to us,” Mr Pletikosa said. 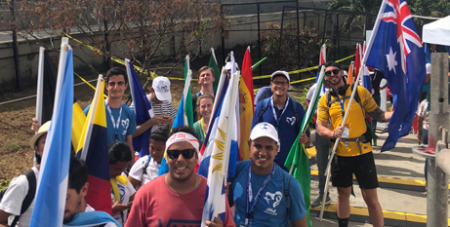 One of a handful of Australian pilgrims chosen for special roles for WYD events, Mr Pletikosa said the Vigil Mass with Pope Francis, where he was the Australian flag bearer, had a tremendous impact on him. “This humbling experience provided me with the opportunity to meet young Catholics from the various countries present. Mr Pletikosa said he used his height to give the Australian flag prominence. He said experiencing that multitude of people in communal silence was awe-inspiring.